"Daughter--that's my name. Daughter McGuire--I'm eleven." When Daughter McGuire, her mother, and her younger brothers, Satchel and Jerry Lee, move next door to her grandparents, she's faced with starting over in a new school, making new friends, and keeping clear of troublemakers like the Avengers. Life would also be easier if her father hadn't run off to Colorado. If her parents were together again, her mother's creepy friend Jim Signet wouldn't be hanging around. But things pick up when Daughter and her classmates Connie and Anna discover Topknot Cave and start the Explorers Club. And at school Mrs. Jackson, Daughter's teacher, suggests an exciting family heritage project. The hitch is that some people think that Daughter's family heritage is too "mixed-up". According to her family tree she is African-Italian-Irish-Jewish-Russian-American. One of the Avengers calls her a "zebra", because one of her parents is black and the other is white. Daughter is so upset, she begins to wonder what she should call herself. As her project comes together, Daughter learns more about her background and the story of the courageous woman whose name she carries. Little does Daughter McGuire know that her own courage will soon be tested in a way she had never dreamed of. 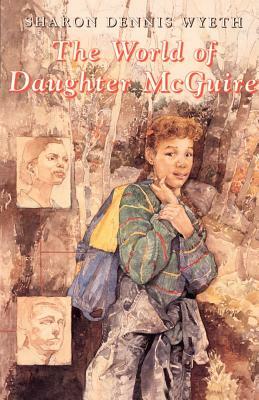 Sharon Dennis Wyeth wrote The World of Daughter McGuire because she wanted to issue a challenge. As she says, "Daughter McGuire's world is by no means perfect. Parents don't behave the way you want them to and there are cruel acts of bias. But there is also humor in this world and love aplenty in Daughter, Satch and Jerry Lee's not-so-typical, typical extended family. I want my readers to make connections in spite of external bias, to celebrate ourselves as individuals in a world where conscience counts more than color." Sharon Dennis Wyeth grew up in Washington, D.C., where she attended public schools. She graduated from Radcliffe College in Cambridge, Massachusetts. She has written many books for young readers, including the Pen Pals series, Annie K's Theater, and Always My Dad. She lives in Montclair, New Jersey, with her husband, Sims, and daughter, Georgia.